Body modification aficionados will go to great lengths to change the appearance of their bodies. 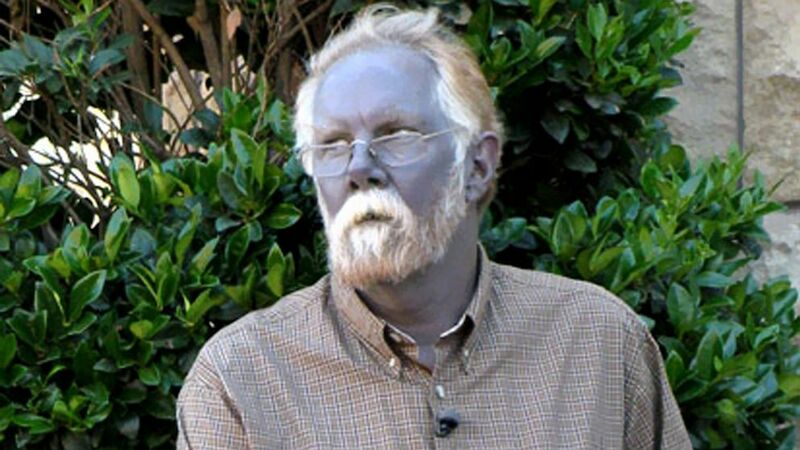 Paul Karason turned his entire body blue in an unproven treatment for dermatis using colloidal silver earning him the nickname "Papa Smurf." Silver is a mineral that has no known purpose in the human body. Silver has anti-microbial properties leading to its use in wound dressings. Silver is difficult to keep dissolved in water and will rapidly settle out of solution, so it is generally combined with other materials to create a 'colloid' to keep it suspended in the other material. So colloidal silver is just mineral sliver mixed in a carrier material. Alternative medicine practitioners have claimed colloidal silver can treat a wide variety of conditions from Lyme's disease, HIV infection, emphysema, tuberculosis, stomach ulcers, rosacea, a variety of minor viral and bacterial illnesses, gum disease, and various other conditions in spite of weak or no evidence that any of these claims are true. The use of silver by mouth or injection has been deemed likely unsafe by the FDA. The website Quack Watch (motto: Your Guide to Quackery, Health Fraud, and Intelligent Decisions) wrote a nice article on Colloidal Silver. There are other metals that accumulate in the body and cause dermatologic manifestations including gold (a condition know as 'chrysiasis'), copper, lead, mercury, cadmium, nickel, and arsenic. "Papa Smurf" ultimately died of pneumonia after suffering a heart attack. However, he was a heavy smoker and was in poor health and so the silver accumulation wasn't necessarily to blame, although silver poisoning has been linked to kidney problems and possible loss of night vision. Is there a treatment for argyria? Possibly. A case report from the Annals of Dermatology published in 2013 suggests that a Q-switched laser operating at 1064 nanometers can effectively treat Argyria. It just so happens, we have one at Fade Away Laser. We have yet to treat clients with Argyria, but we'd certainly be very interested to try.